Windows operating systems have quite a few keyboard shortcuts (hotkeys) associated to standard actions, but the majority of users don't know them, and the people that do usually miss the possibility to be able to create their own hotkeys, something that can be done with WinHotKey. This small application that takes a place in the system tray as a small blue Windows icon, works in the background to increase the workflow thanks to the possibility to associate hotkeys with any application or standard action. All you will have to do is double click on the WinHotKey icon to be able to access an index with all the shortcuts that are currently assigned by the operating system, with the possibility to modify those that already exist or to create new ones. The new hotkeys can be associated directly to a program, used to control the active window, open a document or folder, or even to write a pre-established text. 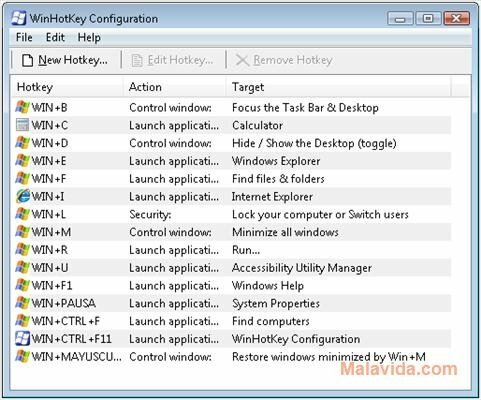 Therefore, if you want to make your control of the Microsoft operating systems more dynamic, download and install WinHotKey as soon as possible.